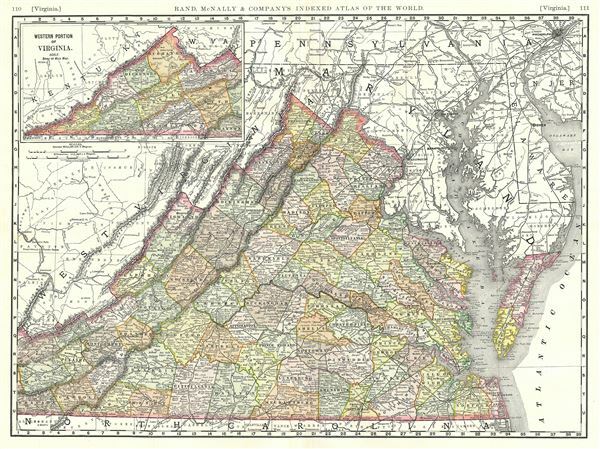 A fine example of Rand McNally and Company's 1889 map of Virginia. It covers the entire state in great detail with the western portion of Virginia featured in an inset in the upper left quadrant. Parts of West Virginia, Maryland, Delaware, Pennsylvania and New Jersey are also included. The map notes numerous towns, cities, railways, mountains, rivers and other topographical details, with relief rendered by hachures. This map was issued as plate nos. 110 and 111 in the 1893 edition of Rand McNally and Company's Indexed Atlas of the World- possibly the finest atlas Rand McNally ever issued. Rumsey 3565.086 (1897 edition). Philips (atlases) 1026 (1898 edition).